According to the December 2018 edition of Hotel Horizons®, U.S. hotel occupancy will rise to 66.2 percent next year, a fifth straight record level. The growth in occupancy is primarily the result of a projected 2.1 percent increase in demand, more than enough to offset an estimated net increase in supply of 1.9 percent for the year. Based on an upward revised outlook for the U.S. economy, CBRE Hotels Americas Research is forecasting the nations hotels will enjoy a 10th consecutive year of growth in 2019. According to the December 2018 edition of Hotel Horizons®, U.S. hotel occupancy will rise to 66.2 percent next year, a fifth straight record level. The growth in occupancy is primarily the result of a projected 2.1 percent increase in demand, more than enough to offset an estimated net increase in supply of 1.9 percent for the year. 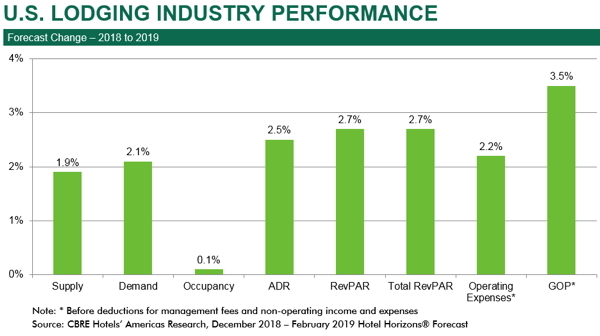 CBRE Hotels Americas Research has been forecasting the performance of the U.S. hotel market using its proprietary Hotel Horizons® econometric model since 2001. The model identifies the historical relationship between the changes in nations economy and changes in lodging demand. These relationships then are applied to project future demand. The improvement in the CBRE-EA economic forecast is based on the remaining impact of the fiscal boost from tax-law changes, capital spending, improving wage growth and consumer confidence. 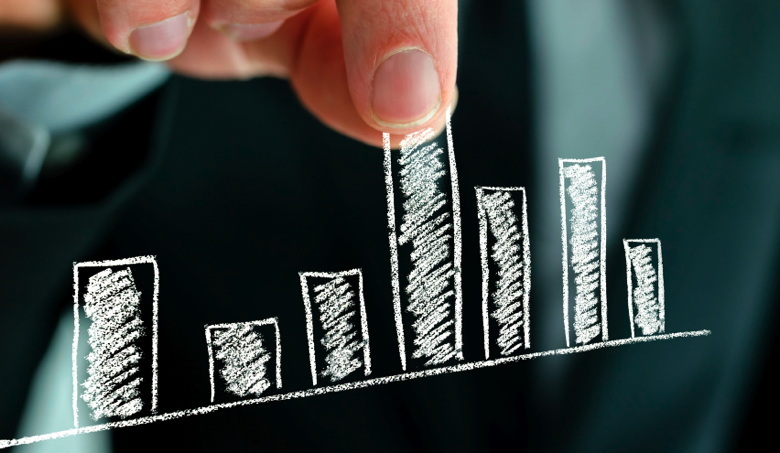 We have already seen the positive influence these factors have on the economy, and lodging industry, in 2018. The impact will persist in 2019, Corgel said. Given the upward revision to the economic forecast, our projections for 2019 growth in demand have risen from the 1.9 percent figure presented in our September 2018 report to the 2.1 percent in the current December 2018 report. The direct result is a boost in our 2019 projected occupancy level from 66.1 percent to 66.2 percent, Woodworth said. While lodging demand for the entire U.S. market is forecast to increase by 2.1 percent in 2019, the demand for accommodations in the 60 markets covered by CBRE is projected to grow by a strong 3.3 percent. This is significant because the majority of hotel investment activity occurs in the nations largest cities. Supply growth in the 60-market Hotel Horizons® universe (3.6 percent) is forecast to be almost double that of the nation as a whole (1.9 percent). Supply is expected to grow at a greater pace than demand in 65 percent of our Horizons® markets during 2019. However, despite the surge in new competition in these preferred markets, all 60 will enjoy an increase in ADR. In fact, we are forecasting ADR increases greater than the projected 2.2 percent pace of inflation in 39 of our 60 markets, Woodworth noted. Jacksonville, San Jose-Santa Cruz, San Francisco, Newark, and Atlanta are all lodging markets forecast to enjoy 4.4 percent or more ADR growth in 2019. The year 2021 seems far away for most industry participants, however, those with an ownership interest need to be planning their future investment strategies. In the meantime, the magnitude of profit growth may not be spectacular, but the probability for revenue growth is solid, and operating margins remain well above historical levels, Woodworth concluded.